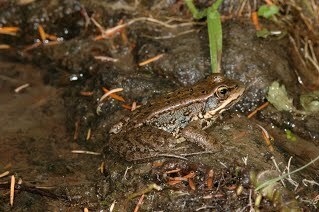 Background: As its name suggests the Cascades Frog (Rana cascadae) is found in the Cascade Mountains of Washington, Oregon, California and also occurs on the Olympic Peninsula. This is a high elevation species generally found between 760- 1830 m.
Adult and Juvenile Description: This species is medium in size (5-6cm long) with a relatively slender body. The dorsal side of this frog is relatively smooth (with some tubercles and small bumps), may be anything from tan or copper to an olive green, and has light to moderate dark spotting. There are dorsolateral folds present on both sides that extend along the full length of the animal. The eyes are golden in color and oriented outward. A dark mask around the eyes and a light line above the upper jaw are usually present. The ventral side is yellow with a yellowish-green to gray or brown mottled groin area. It is rare, but sometimes an individual will have orange blotches on the belly or on the underside of the hind legs. The hind legs are relatively long with light webbing between toes. During the breeding season the males will have a swollen pad on their thumb called a nuptial pad. Larval Description: Tadpoles can grow to be up to 5.4 cm in length. They are dark in color with silver specks most noticeable on the belly. The tail is about twice the length of the body and is translucent with black specks. 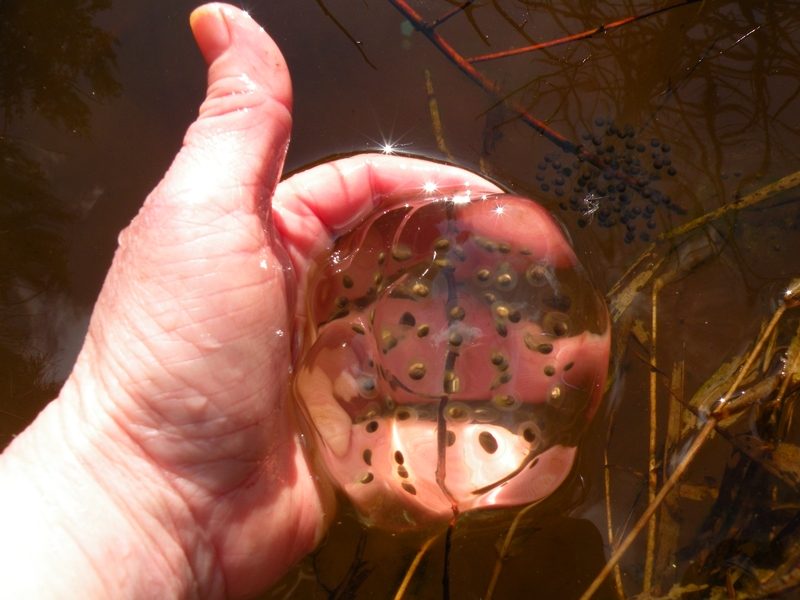 Studies suggest that tadpoles may recognize and remain close t others from the same egg mass so are often seen in large groups. Egg Description: This species lays its eggs after snowmelt and as a result laying season can be anywhere from early to late spring depending on elevation. Egg masses are about the size of a small grapefruit. The jelly is soft and thick around each individual egg. The eggs are bicolored with one side being dark and the other light. Egg masses are often found in large quantities within a small area and may be clustered on top of one another. The egg mass is unattached and is usually only partially submerged. As eggs mature the jelly often breaks apart and spreads out. The outer layer is often green from algae. Habitat: This species occurs at higher elevation in meadows and moist forests. In Whatcom County they have been observed as low as 520 meters. They breed in both permanent and temporary bodies of water that are results of cold springs and snowmelt. Eggs are laid in shallow water that is less than 20 cm. deep. Tadpoles are found in warmer areas of the pool.